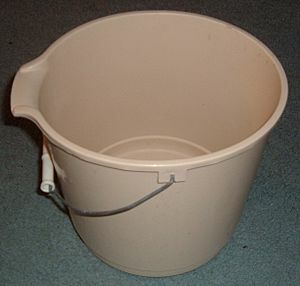 A bucket is a container with a wide open top and a handle that is mainly used for carrying liquids. In some cases, solids may also be carried in a bucket (like sand which is hard to carry in your hands). Some buckets are used for work, and some more for leisure, as seen here . A bucket used for work is often made of a strong material such as iron or steel and is used to carry things like coal or soil. 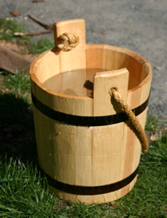 A bucket used for leisure, e.g. for making sandcastles, is normally made of plastic. In rare cases, a bucket may be worn as a piece of clothing, people may wear a bucket on their heads for humorous reasons. Buckethead is a famous example of this. A young lady carrying a bucket, drawing by German artist Heinrich Zille. A mop bucket with a wringer. Bucket Facts for Kids. Kiddle Encyclopedia.